You are about to travel to Edgecombe St. Mary, a small village in the English countryside filled with rolling hills, thatched cottages, and a cast of characters both hilariously original and as familiar as the members of your own family. Among them is Major Ernest Pettigrew (retired), the unlikely hero of Helen Simonson’s wondrous debut. Wry, courtly, opinionated, and completely endearing, Major Pettigrew is one of the most indelible characters in contemporary fiction, and from the very first page of this remarkable novel he will steal your heart. The Major leads a quiet life valuing the proper things that Englishmen have lived by for generations: honor, duty, decorum, and a properly brewed cup of tea. But then his brother’s death sparks an unexpected friendship with Mrs. Jasmina Ali, the Pakistani shopkeeper from the village. Drawn together by their shared love of literature and the loss of their respective spouses, the Major and Mrs. Ali soon find their friendship blossoming into something more. But village society insists on embracing him as the quintessential local and her as the permanent foreigner. Can their relationship survive the risks one takes when pursuing happiness in the face of culture and tradition? 1. 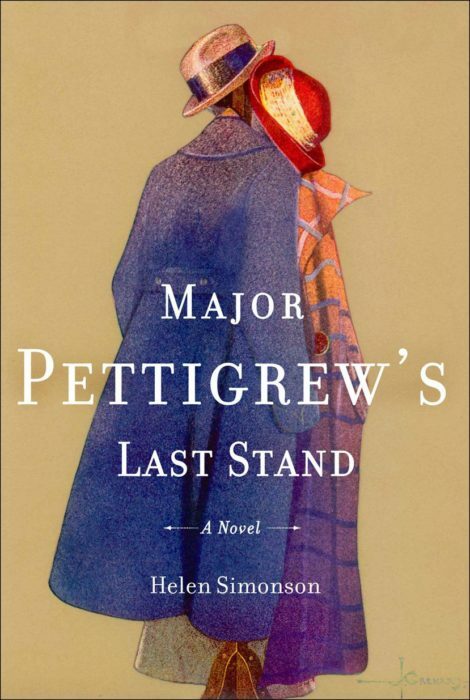 In the outset of Major Pettigrew’s Last Stand, the Major is described as feeling the weight of his age, but on page 320, the morning after his romantic evening with Mrs. Ali at Colonel Preston’s Lodge, Simonson writes that “a pleasant glow, deep in his gut, was all that remained of a night that seemed to have burned away the years from his back.” Love is not only for the young and, as it did the Major, it has the capacity to revitalize. Discuss the agelessness of love, and how it can transform us at any point in our lives. 2. A crucial theme of Major Pettigrew’s Last Stand is that of obligation. What are the differences between the Pettigrews’ familial expectations and those of the Alis’? What do different characters in the novel have to sacrifice in order to stay true to these obligations? What do they give up in diverging from them? 3. Major Pettigrew clings to the civility of a bygone era, and his discussions with Mrs. Ali over tea are a narrative engine of the book and play a central role in their burgeoning romance. In our digital world, how have interpersonal relationships changed? Do you think instant communication makes us more or less in touch with the people around us? 4. Much of the novel focuses on the notion of “otherness.” Who is considered an outsider in Edgecombe St. Mary? How are the various village outsiders treated differently? 5. First impressions in Major Pettigrew’s Last Stand can be deceiving. Discuss the progressions of the characters you feel changed the most from the beginning of the book to the end. 6. The Major struggles to find footing in his relationship with his adult son, Roger. Discuss the trickiness of being a parent to an adult child, and alternatively, an adult child to an aging parent. How does the generation gap come to impact the relationship? 7. Major Pettigrew and Mrs. Ali connect emotionally in part because they share the experience of having lost a spouse, and in part because they delight in love having come around a second time. How do you think relationships formed in grief are different from those that are not? 8. For Major Pettigrew, the Churchills represent societal standing and achievement, as well as an important part of his family’s history. However, as events unfold, the Major begins to question whether loyalty and honor are more important than material objects and social status. Discuss the evolving importance of the guns to the Major, as well as the challenge of passing down important objects, and values, to younger generations.